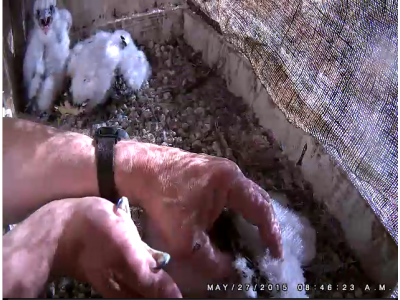 Wednesday morning, May 27, was a big day for the peregrine chicks. They got to meet Michigan Department Natural Resources (DNR) Wildlife Biologists, Nik Kalejs and Ken Kesson, who placed identification bands on their legs. Everything went very smoothly. The chicks were out of the box for about a half hour. Rebecca oversaw the whole process and used her best outdoor voice to share her opinion of the banders and the banding process. Good thing we can't understand Peregrine!